There have been hundreds of newspaper articles published around the world about the 100th anniversary of Armistice, but one Reddit post from an Antwerp man may have gotten the most attention. 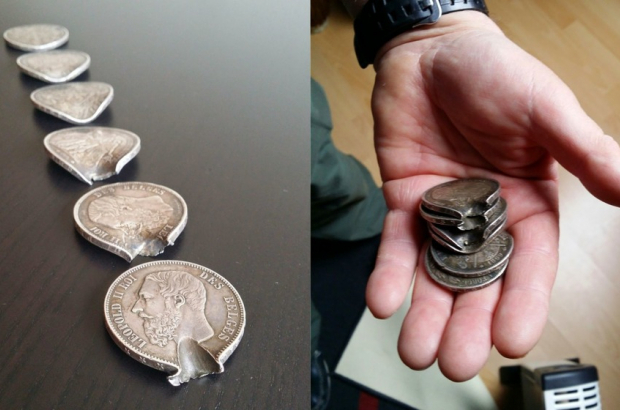 International news and social media picked up the story of Vincent Buyssens of Antwerp, who’s simple Reddit post “These coins stopped a bullet and saved my great-grandfather’s life during World War 1” with a fantastic photo of a line of coins, one more damaged than the next, was voted up 131,000 times and got more than 2,000 comments. Over the last 48 hours, the story has picked up speed and been viewed more than one million times. Buyssens, 28, told the story of his great-grandfather – passed down through the generations – to VRT. Optatius was indeed injured and hit the ground. The German soldier kicked him in the head to make sure he was dead, but Optatius didn’t move. The soldier left, and Optatius fled. He wound up in the Netherlands and eventually the UK, where he fully healed and went back to Belgium after the war to start a family. He died in 1958. “My father collects memorabilia from the First World War, and there are a few personal things that belonged to my great-grandfather, including these coins,” said Vincent. “So this story is well-known in my family. I heard it some time ago, and it always stayed with me. Vincent points out that, as his great-grandfather produced children only after the war, the coins saved many lives that day – including his own.